Dr. David McGuire became interested in dentistry after growing up in a family of many dentists. He graduated from Pfeiffer College and The University of North Carolina School of Dentistry. He enjoys meeting new patients and getting to know them and their families. Dr. David takes every opportunity to attend continuing educations courses to learn new treatments and follow new advances in dentistry. He is member of the North Carolina Dental Society, American Dental Association, Pankey Alumni Association, Academy of General Dentistry and Fellowship in the International Congress of Oral Implantologists and board member of the Jackson County Health Department. He is a member of First United Methodist Church and holds several church administrative positions. He assists and volunteers with several community organizations throughout the year. He loves the outdoors and spends time hiking with his dogs, camping, organic gardening and spending time with his wife Kathy and their grandchildren. The family history dates back to James Zachary who practiced dentistry after the Civil War in the 1860′s. His second child, Daisy was born in 1880. She apprenticed with her father to be a dentist until the North Carolina Dental Board was founded. The Board required her to go to dental school and be licensed. In 1908 Daisy McGuire was the first woman licensed to practice dentistry in North Carolina. During this period, she married Wayne McGuire of the Norton Community in Jackson County, NC. She found more dentistry to do in Sylva than she could handle, therefore sent Wayne to dental school. He graduated in 1911. 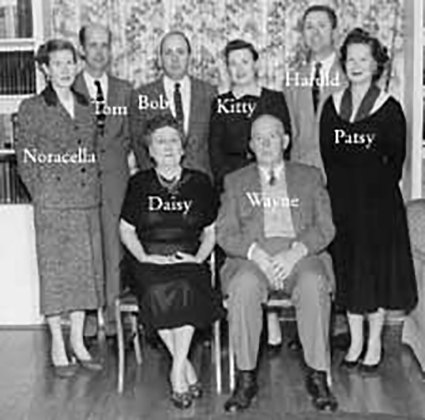 The couple raised three daughters: Noracella, Patsy, and Kitty Dean. All three became dentists. Noracella returned to Sylva and married Tom Wilson who became a dental technician. Patsy sat next to Harold McGuire in dental school. They married in 1937. Therefore the name continued. Harold and Patsy graduated first and third respectively in their classes. The couple returned to Sylva to work in the office with Daisy, Wayne, Noracella and Tom as their technician. Kitty Dean met Bob Gamewell in dental school and married. Their practice was in Murfreesboro, TN. Dr. Daisy retired in 1977 at the age of 97. She was the nation’s oldest practicing dentist.